Here's another card I received from a Convention swap. This GREAT card was made by fellow Demonstrator Karina Chin. 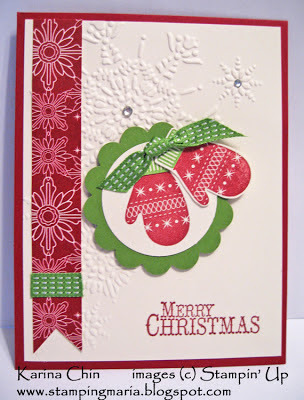 She used the Chock-Full of Cheer stamp set with Cherry Cobbler, Gumball Green, and Very Vanilla Cardstock and ink. For the accent, she used Be of Good Cheer Designer paper and Gumball Green stitched ribbon. Finally, Karina used the Northern Flurry Embossing Folder, the 1-3/4" circle punch, the 2-3/8" scallop circle punch, and for BLING, she added Rhinestones!